The Tug Hill is known for it's snow and snowmobiling and not so much it's deer hunting. Sure there are deer there, but the massive snow depths make the deer herd vary greatly from year to year. After a summer of promising trail camera pictures of bucks I was eagerly awaiting the first day of the season. October came and went with not a lot of buck sightings.In the large tract of woods I hunt it's not common to go quite awhile without seeing a deer, let alone a buck. November came and I went to Canada on a hunting trip and enjoyed the experience, but with a close eye back home to the weather revealed the tug hill getting some tracking snow. As luck would have it the weather turned frigid where we were hunting and the lake we stay on started to freeze. By boat being the only way in and out of our remote cabin, we were advised to pack up and head back to New York. So, off we went on the thirty hour commute home. We arrived at about noon and with little sleep. I packed my bags and headed for the Tug Hill and arrived at camp just at dark. The ground was bare, but the forecast called for snow by morning. And it was dead on. At 5 a.m. the snow had just stopped and I eagerly awaited day light. The first sign of shooting light and I was off bounding around the ridges looking for a good buck track. At exactly 8 a.m. I came on to a track longer than my 7mm magnum shell and I knew this was the one I would track. He took me up a steep ridge and into a recent cut over where there was lots of pricker bushes and he ran into a couple does. He ran around in circles and finally got the one he wanted to break off the pack. I could tell by his tracks he was actually pushing her to where he wanted her to go. There was still a touch of snow in the tracks so I knew I needed to sort things out and get moving. I was going pretty hard for about an hour when all of a sudden, without any signal, I came up on two fresh beds. And, the tracks after the beds were clear of snow. I knew then it was creep time. Slowly and methodically I took a step and watched. After about 50 yards I came to a tree that he had just raked with his antlers. The bark was still moist on the snow. She must have tried to make her escape when he was busy beating up this tree because soon after it they were bounding again down into a swamp and out into an old skid road. I crept along sneaking and peaking and then there was a crash and a blur of white antlers. He ran straight away for about 75 yards and kept a pine tree between us. But then his "queen" bolted to the left and I knew he would follow... that was my chance. I got a good bead on him and swung through, fired and down he went! 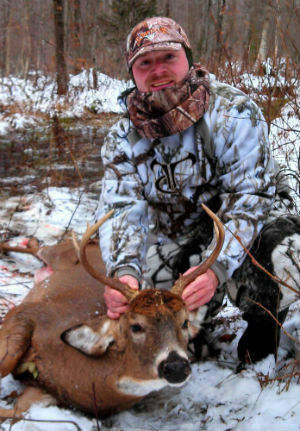 A beautiful 170 pound Tug Hill buck was down by my favorite method of tracking.